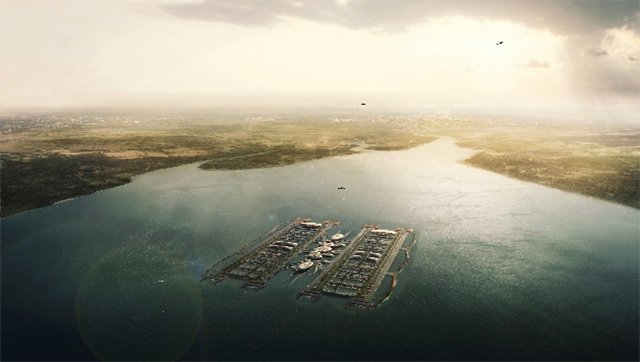 Architect Gensler has ploughed into the debate over London's future aviation requirements with this highly speculative, sci fi-like rendering of a floating airport in the Thames estuary. Dubbed London Britannia Airport, the design calls for four 5km-long runways, floated into place and anchored to the riverbed, with terminals and lounges resting between them. In contrast, a rival proposal by Foster + Partners would be sited on an Estuary island built from reclaimed land. Britannia would be operational 24/7, connected to central London via underground railway tunnels and, according to Gensler, would avoid harming the local bird population, one of the prime ecological concerns surrounding 'Boris island'. The images are impressive, replete with glistening river, celestial splendour and artistic lens reflections, and seemingly influenced more by George Lucas than Gatwick. In other words it looks totally unrealistic, and perhaps that is the point: with a projected price tag of £50 billion, don't expect to be landing on it anytime soon. Gensler has a history of unrealised riverine projects: the firm designed the floating Thames walkway that briefly wowed the Mayor last year. As for poor old Heathrow, Gensler proposes turning it into an 'eco-city', housing up to 300,000 people in near-silent bucolic bliss (a notion backed by the Town and Country Planning Association). Meanwhile, back in reality, the Conservatives are gearing up for an internal ding-dong over whether to build a third runway or give their backing to a new Estuary airport. Further images and information at The Verge.